A few weeks ago, Rachel and I made our very first visit to DC’s Union Market. 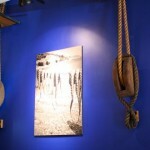 We came with one goal in mind: to have lunch at Rappahannock Oyster Bar. After hearing so much praise from friends and media alike, we were curious what all the buzz was about. Rappahannock Oyster Bar has perhaps one of the largest vendor spaces in Union Market, complete with a separate dining area in addition to the bar that wraps around the kitchen, which is where we sat. From there, we had a great view of one of the chefs shucking oysters. Speaking of which, we ordered half a dozen oysters which included Rappahannock, Stingray, and Olde Salts. 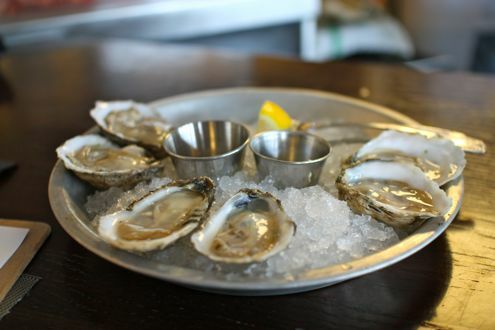 They were arranged, in that order, from sweet to briny and were accompanied with mignonette and cocktail sauce with fresh horseradish. Of course, the oysters were incredibly fresh, but they were just a precursor of what was to come. And that brings us to the crab cake. I tend to typically stray from hyperbole, but the crab cake served at Rappahannock is perhaps the best in the District. I’m not kidding, this dish was perfect. The kitchen only uses lump and backfin meat, no filler. 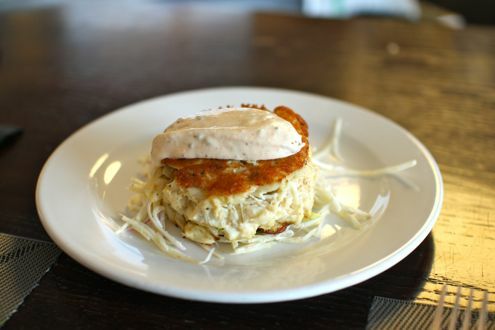 Served atop a bed of celeriac, the crab cake, which is ever so slightly crisp on the outside, is nearly the size of a softball. Topped with a dab of remoulade, the crabmeat was supremely fresh and just as juicy, a real treat. What’s more amazing was that it only cost $14. A pair of these would easily run over $30 at a restaurant, which makes this one incredible value. Realizing that one crab cake was not enough food to split amongst the two of us, we decided to also order the seared scallops. 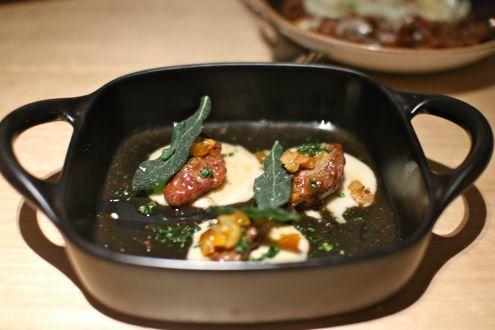 Once again, Rappahannock tremendously impressed us with this dish. 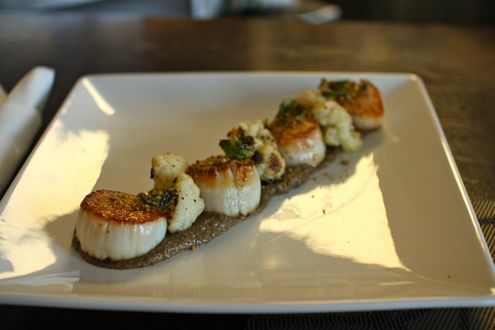 The plate arrived with four large, excellently-cooked scallops that were beautifully arranged with roasted cauliflower and sitting on a bed of chutney. Just like the crab cake, it only cost $14, which is nearly incomprehensible given the size of the scallops as well as the fantastic preparation. Rappahannock Oyster Bar is a welcome addition not only to the District, but to the already wonderful Union Market. 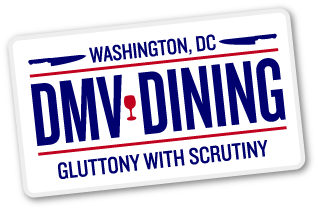 And while it’s not the most convenient location, it’s worth the visit just for that amazing crab cake. 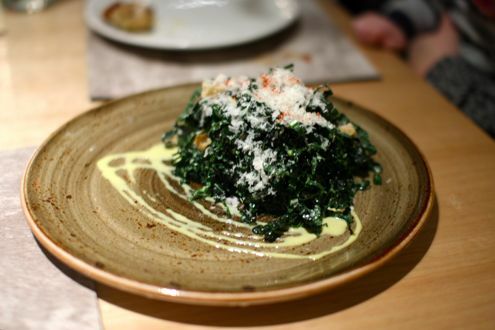 One of the most anticipated restaurant openings of 2012 was Bryan Voltaggio’s latest project, Range. Located in Chevy Chase Pavilion, just 40 miles south of Volt where Voltaggio first gained fame, the former Top Chef contestant’s latest venture is his most extensive yet. 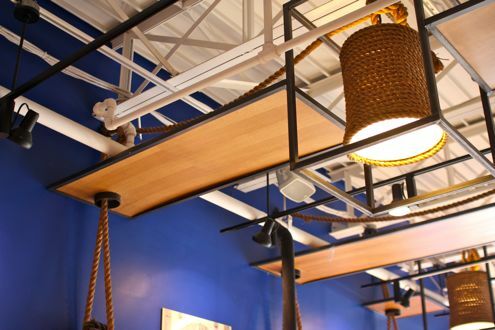 With nearly 14,000 square feet of space, this is not your typical restaurant. Taking a small plates approach, the menu is broken down into “kitchens”. 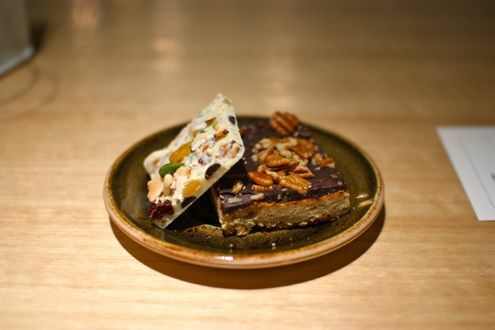 That’s because Range has its own raw bar, bakery, wood-burning pizza oven, and even a confectionery shop. 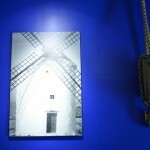 And just like the restaurant itself, navigating the menu is a massive undertaking. With a 5:30pm reservation (which we made nearly a month ago) and stroller in tow, we were greeted by the hostess and then taken to our table towards the back of the house. This worked out well since we had more than ample space for our stroller while having a nice view of the kitchen. As fairly new parents, we have also been analyzing whether restaurants are baby-friendly or not. While Range was able to accommodate our stroller, the restaurant didn’t have a changing table in their restrooms. Needless to say, we had to work around that since a diaper situation arose. But enough baby talk, let’s discuss booze! 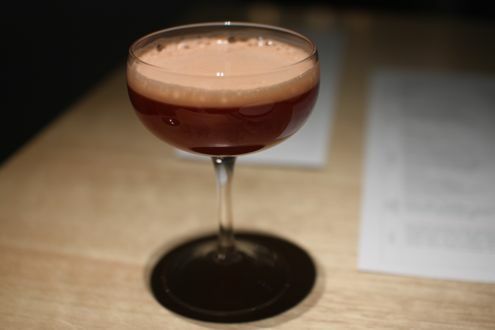 To start off, I ordered the Makeshift Harmony, a rum-based beverage that featured St. Germain, lemon, and bitters. Very refreshing without being too sweet. As mentioned earlier, the menu is fairly large which makes deciding what to order somewhat overwhelming. For example, there are no more than 19 different items one can order from the salumeria. Our waiter was very helpful in describing the plates, suggesting we should order two to three per person. 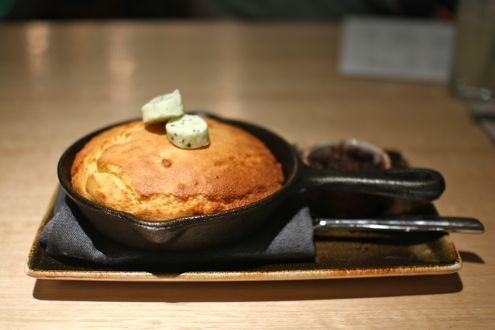 Our first dish was from the bakery: skillet cornbread with bacon marmalade. First of all, this is probably one of the best values on the menu. The cornbread was enough to feed four people! And as good as the cornbread was it was the bacon marmalade that stole the show. Seriously, I would pay money just for a jar of this stuff. It was that good. A must-order in our book. From the “roasted” portion of the menu came the pork cheeks. Featuring celeriac and moustarda, it was perhaps the most forgettable dish of the evening. At $14, the portions were tiny, and while the cheeks were indeed succulent, there just wasn’t enough on the plate to equate for a satisfying dish. On the other hand, the goat cheese ravioli with braised meat ragu was the star of the night. 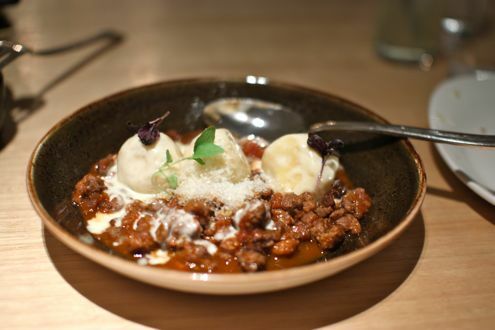 The plate featured a trio of puffy ravioli stuffed with warm goat cheese while being surrounded by the savory ragu. I particularly enjoyed the sauce, scraping every last drop from the plate using my fork. Which leads us to the lobster mac and cheese. Undoubtedly the heaviest dish of the night, it was also the most savory. Like the ravioli, the macaroni was homemade, and it showed. My only beef with the dish, however, was the lack of lobster. There were two small chunks adorned atop the macaroni, and at nearly $20 for the plate, one would think you’d get a little more lobster at that price. Other than that, it was an enjoyable creamy dish. 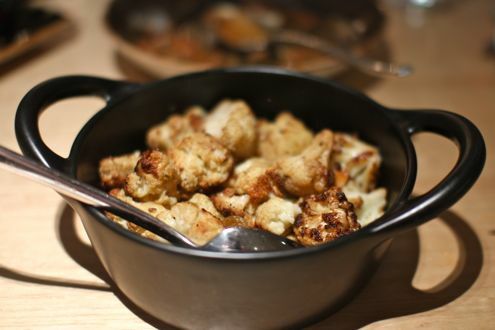 In between all these dishes we also ordered a side of roasted cauliflower. Prepared with golden raisins and za’atar, it was an excellent accompaniment to the meal and was probably our second favorite dish behind the ravioli. Not only that, but for $6 it was a very generous portion. Not sure if the lowest-priced items are always the largest in quantity at Range, but that was definitely the case with both the cornbread and cauliflower. Just when we thought we were finished, along came the candy cart. 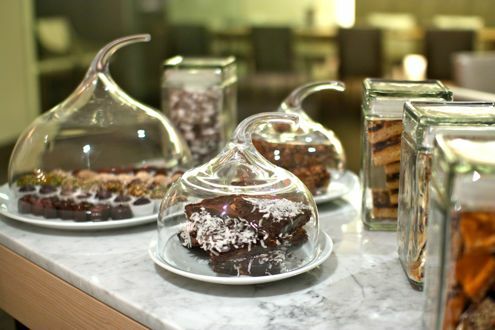 Featuring all the desserts made at the restaurant’s confectionery station and housed in gorgeous glass containers, how could you not order something? We wound up getting a chocolate covered blondie as well as a cashew bark. The service was terrific – our waters were constantly refilled, plates were cleared in a timely fashion, and our waiter was very knowledgeable about the menu. Given the menu format, we recommend you dine at Range as a group rather than a couple. Not only will you be able to try more dishes, but it would probably cost you less as well. Our bill totaled to over $100 for just the two of us which kind of took me by surprise. The cornbread and cauliflower alone could have been split amongst a table for four. At any rate, Range is a welcome addition to what was formerly a dining wasteland in Friendship Heights. Speaking of which, Washingtonian recently broke the news that Voltaggio’s casual outpost Lunchbox will debuting in Chevy Chase Pavilion as well. Hey Bryan, mind opening Family Meal down here as well? Because, you know, fried chicken. A few weeks ago, we were invited by Christian Falatko, the owner of Medi, to come down to Shirlington and sample his Greek fast-casual concept. Christian is a Virginia native who has had quite an extensive history in the restaurant industry. He managed a catering company where, at one particular event, waited on four living presidents. After that, Christian and his business partner and lifelong friend George Theodorou opened Delia’s Mediterranean Grill in Alexandria. Last summer, the two decided to open a casual offshoot of Delia’s which they named Medi. Located in downtown Shirlington, Medi is like a Greek version of Chipotle where diners construct their meal based around three styles: a pita, bowl, or salad. Proteins range from Greek marinated chicken to slow-roasted pulled pork to Mediterranean skirt steak. Our favorite, however, was the spicy braised lamb seasoned with peppers and medi spices. And vegetarians fear not – you can order balsamic grilled veggies as your main ingredient. 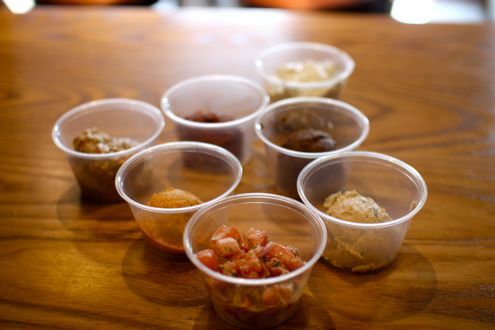 From there, you have a plethora of freshly-made dips and toppings to choose from. 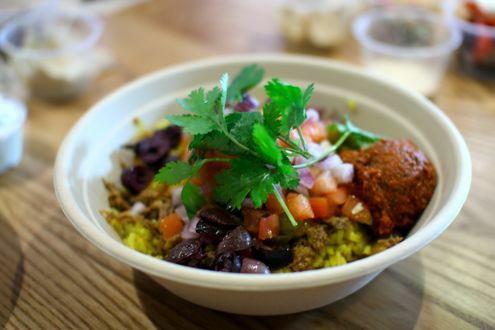 Medi even offers preconfigured topping selections such as Moroccan and Europa style featuring a combination of veggies and dips. Be sure that your meal includes the Kalamata olive spread and roasted eggplant dip as they particularly stood out due to their freshness and flavor. The “Spicy 17 Spread”, Medi’s version of harissa, was pleasantly spicy without having to reach for a glass of water. Other harissa dips are oftentimes too spicy but this spread had just the right amount of kick to it. I ordered a Moroccan-style lamb bowl which included the Spicy 17 spread, sweet peppers and onions, cilantro, tomato, and red onion. Sitting under a bed of lemon and mint infused rice, it was a satisfying dish with flavors that really complemented one another, especially between the sweet peppers and raisins. 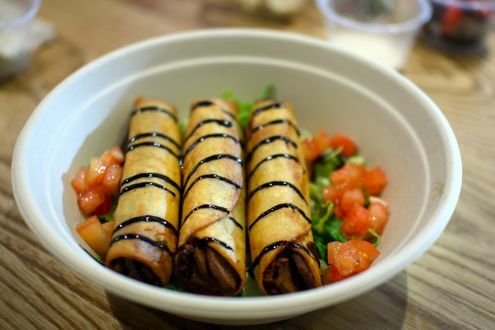 On top of that, Medi also offers “Gyritos”, the restaurant’s take on a Greek style taquito. Featuring gyro meat and feta, it’s then rolled into a white corn tortilla, fried, then topped with a balsamic glaze and a side of tzatziki. Delightfully crispy, the Gyritos make for an excellent alternative if you’re not in the mood for Medi’s typical offerings. All and all, we had an excellent visit at Medi. 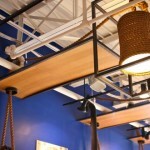 The nautical-themed interior has a warm, inviting feeling to it. 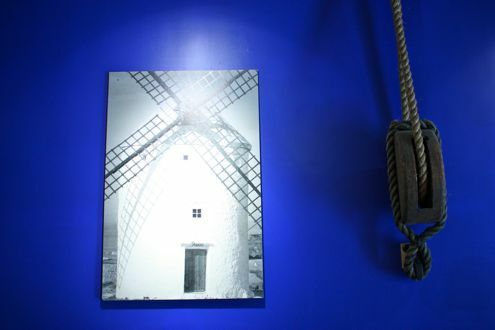 In fact, Christian mentioned that the ropes on the walls were actually from the ship used in the Pirates of the Caribbean films. 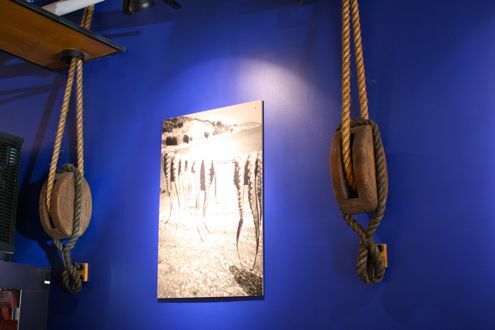 If you’re ever in the mood for Greek but don’t feel like sitting down for a full-service meal, Medi makes for a solid choice. 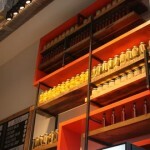 Perhaps one of the most anticipated restaurant openings of 2012 was Dupont Circle’s DGS Delicatessen. Rachel and I have longed for a Jewish deli that would not only do New York proud but also wouldn’t be another short-lived, poorly-executed knockoff. Remember Uptown Deli and Bubby’s? Those two didn’t fare so well, and while Parkway does a reasonable job providing an assortment of Jewish fare, the place gets so chaotic on the weekends that we’ve sworn it off for brunch. Enter DGS Delicatessen. With head chef Barry Koslow working the kitchen, we knew this wouldn’t be your average deli. 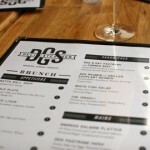 We went with a couple of our friends for brunch a few weeks ago to finally see if DGS met the hype. We kicked the morning off with some libations. The Le Marais is the gem of the brunch cocktail list, comprised of champagne, St. Germain, orange juice, and bitters. It’s a shame this beverage isn’t served in pitchers, because I easily would have had gone through four more glasses. While it’s oftentimes nice to do a spin on things and make them fancier, sometimes you just want a good ol’ pickle plate. 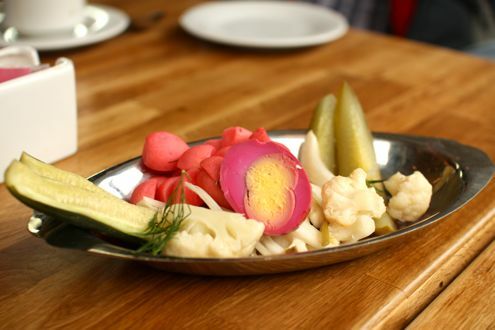 DGS’ plate included just four pickle spears and some other pickled items such as radishes and cauliflower. And while it was beautifully arranged, we kind of yearned for the complimentary pickle bar at Parkway. For our main course, it was no surprise that I went for the pastrami sandwich. This is a sandwich that is prepared with care and for good measure – it takes eight days to make! 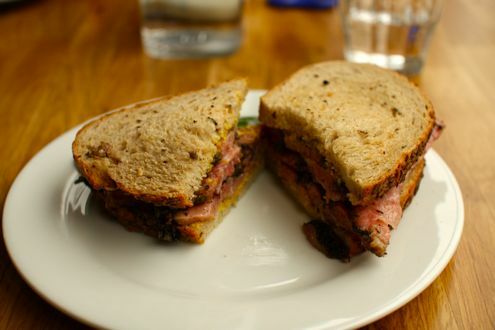 Brined for over a week, the smoky, succulent meat is sandwiched between two slices of warm double baked rye along with a shmear of house mustard. The result is a tender, smoky sandwich that leaves you wanting more. 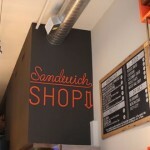 For $13, the sandwich isn’t piled as high as anticipated, but it’s still one of the best you’ll find in the District. However, one would expect some sort of side to accompany the sandwich given the price. Chips, coleslaw, something. Rachel opted for more of a classic brunch choice, DGS’ rendition of Eggs Benedict, aptly dubbed the Benedictberg. 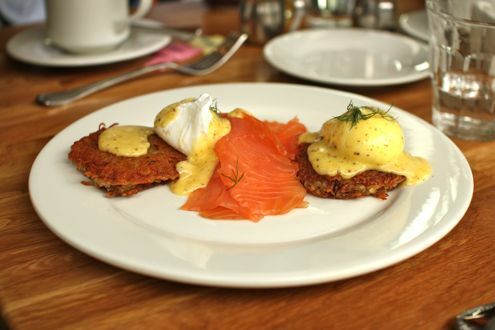 Featuring poached eggs, house-smoked salmon, latkes, and sumac hollandaise, this dish was a clear winner. The combination between the crispy latkes, smoky lox, and rich hollandaise really worked well and made for an excellent brunch dish. 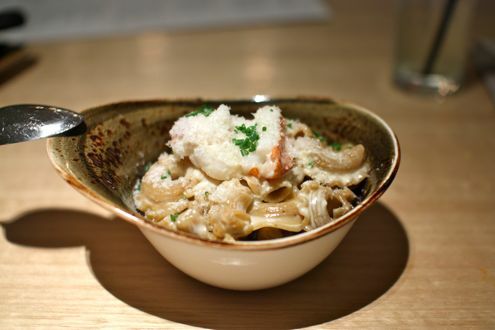 Overall, we felt the food at DGS was terrific while being slightly overpriced. With tip, Rachel and I spent roughly $60 between the two of us. And this was for brunch. With each cocktail at $10 per glass, a meal here adds up quickly. The service was very accommodating given we had two babies with us, and they gave us a table by the front of the house with more than enough room for the strollers. Suffice to say, this will be the first of many visits to this establishment. We only sampled just a fraction of the menu and with items such as pickled blue fish, flanken, and kreplach still waiting to be tried, a return to DGS is definitely in order.